For decades, bookshelf speakers have been an essential part of hi-fi systems. Back in the days, you would match them to the furniture in your home. Now, you may want the speakers to complement your desk or the high-resolution video equipment you own. 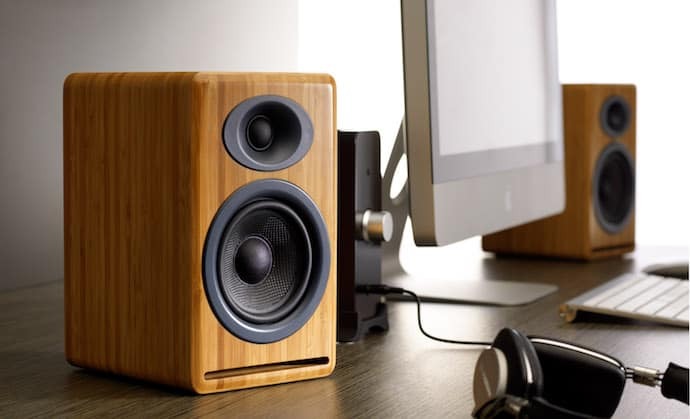 Although bookshelf speakers have always been a favorite of audiophiles, at one point they were almost replaced by commercial desktop speakers or compact speaker sets in the average households. Fear not, bookshelf speakers have been making a big comeback in recent years. And we might agree that their sound quality is unparalleled. So, if you are looking for outstanding sound quality, compact design, and aesthetic appeal, bookshelf speakers would be an excellent option. However, their features, size, and performance may vary depending on your needs, budget, and preferences. I have made a selection of the best bookshelf speakers under 500 bucks, comprising of 10 amazing models. They offer hours of listening pleasure and won’t burn a hole in your wallet. 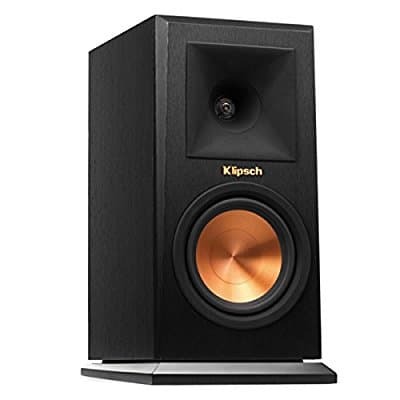 Klipsch is one of the oldest speaker manufacturers. The company has been around since 1946 and takes pride in its hands-on approach to speaker making. The attention to detail and meticulous engineering is reflected in the Klipsch RP-150M. These speakers are a good combination of traditional style and modern design. They come in walnut finish, as well as 3 other finishes: cherry, ebony, piano black. Each speaker is a 2-way design with a linear titanium tweeter and a ceramic cone woofer. As is the company’s signature, the tweeter is horn-loaded to give the RP-150M its unique Klipsch sound. The sound coming from the tweeters is detailed, clear, and pleasant to the ears. Overall, the sound is pristine from top to bottom. The RP-150Ms are primarily designed for home use. They work great in media rooms and home theaters. The grill is magnetic so you can easily remove it to reveal the beautiful copper cone. And you should make sure to properly place them in the room to get the best sound. KEF is another well-known company. This British company has been producing high-quality speakers since the early sixties. In their own words, the company is obsessed with high resolution. This obsession can be observed in the KEF Q100. These speakers are compact. They are big enough to suit home theaters and various media setups, yet small enough to accommodate small areas. The Q100s feature KEF’s famous Uni-Q driver – the tweeter mounted in the middle of the woofer ensures sonic coherence and the best integration of high and low frequencies. The Uni-Q driver cone is made of a magnesium/aluminum alloy. These drivers are based on KEF’s higher-end speakers, so you can expect low distortion and wide-open sound from the KEF Q100. Each Micca PB42X features a silk dome tweeter and a carbon fiber woofer. Unlike our previous two choices which are passive speakers that require an amplifier or receiver, the PB42X’s are active bookshelf speakers with built-in amplifiers. The speaker enclosures are ported to extend the bass response and minimize distortion. Vocals coming from these speakers are clear and precise. The built-in low-distortion amplifier offers an even response on both channels. These speakers are a great value for the money. The Micca PB42Xs are also very compact and lightweight. Their size, neutral design, and sound quality may be a great option for most home setups. 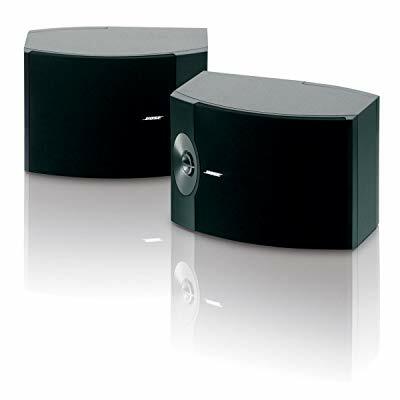 Since these are active speakers, you can connect them to practically any device that has a headphone audio out or line-level audio outputs. The Edifier R2000DBs have great pairing options. The Bluetooth connectivity allows them to be easily hooked up to any Bluetooth-enabled smart device or computer. 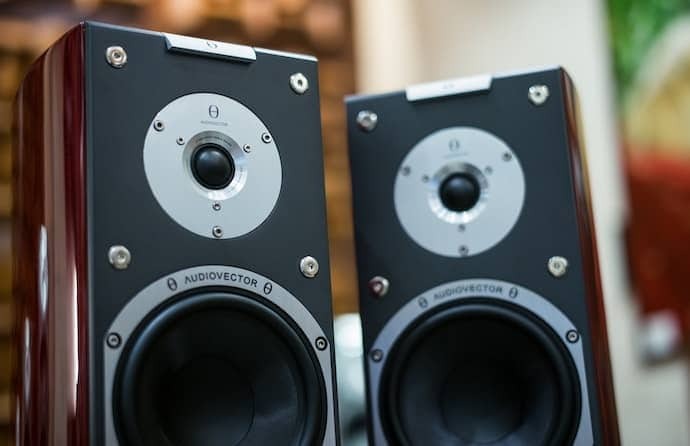 They are labeled as near-field monitors, so you may use them in your small home studio. What’s more, the R2000DBs have an optical input. This allows you to connect various devices with a digital output to your speakers. The speakers pair well with gaming consoles, receivers, TV boxes, and other similar devices. These speakers are active, each powered by a built-in 120W RMS amplifier. They offer two auxiliary inputs so you can have two devices plugged in at one time. There’s a remote control that makes switching inputs and changing volume very convenient. The manufacturer gives a 24-month warranty in the US and Canada. And the speakers are available in piano black or walnut finish. Polk Audio is yet another well-known American company which specializes in high-quality speakers. 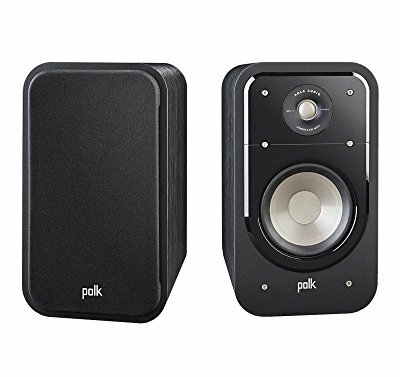 The Polk Audio S20s are among their mid-range bookshelf speakers. They are designed to suit your media room or small home theater. The S20s feature polypropylene woofers, terylene tweeters, and Polk power ports. The combination of these features gives them unique sound properties. The high frequencies are very clear, the bass is punchy, and the sound is accurate with wide dynamic range. These characteristics give the Polk S20s great acoustic balance. You shouldn’t have any issues connecting these speakers to your audio system. They are fairly sensitive at 88dB which allows them to work well even with less powerful amplifiers. The design of the speakers is universal and they have a slim profile. The removable grills are designed for anti-diffraction to not affect the sound when you listen with the grills on. 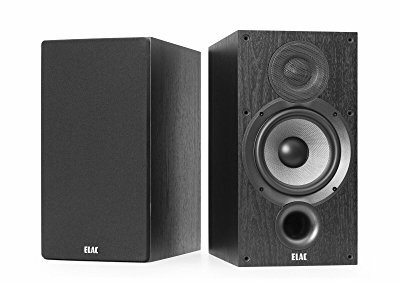 ELAC has been in business even longer than Klipsch, the company opened in 1926. This German brand has successfully evolved into one of the best hi-fi manufacturers with more than 90 years of history. The B6.2 is one of their flagships in the new Debut series of speakers. These speakers are relatively small and compact. They come in black ash finish with a simple black grill, so the speakers would easily blend with your media setup or home studio. The components incorporated into the B6.2 represent an upgrade from the previous series. Also, these speakers received a lot of critical acclaim due to their amazing sound quality. The B6.2s achieve their signature sound from the unique combination of acoustic elements. The woven woofers are soft, made of aramid-fiber, and deliver crisp bass with a distinct distortion-free punch. There is a vented port under the woofer for extended low frequencies. The tweeters are small, but they feature a waveguide which allows for wider dispersion – the end result is wider soundstage and better imaging. If you are willing to spend some more money, but still stay within the budget, consider getting a subwoofer from the same series to get a full-range speaker system. The 301-V speakers from Bose come in a convenient horizontal design which fits easily on any shelf. They’re available in black with modern styling and woodgrain finish. The speakers sport the conventional two-way configuration, with a long excursion 8” woofer and a 1” tweeter. These speakers are equally at home on their own or as a part of a larger entertainment system. 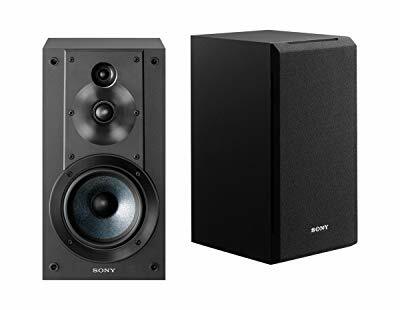 If you plan to use them with your home theater system, they are suitable for use as left, center, and right speakers (you can buy a single 301-V for center). The 301-V can also be attached to one of Bose’s Lifestyle systems. The recommended power sources are 10 to 150 watts. The receiver or amplifier should be able to drive 4Ω loads with no stability issues. These speakers deliver an articulated midrange and strong bass, but not so stellar high frequencies. The 301-V features Direct/Reflecting technology which blends the direct and reflected sound. This way why the speakers can deliver a performance similar to the sound at a live concert. They also feature automatic protection circuitry which makes sure the drivers don’t get overdriven. 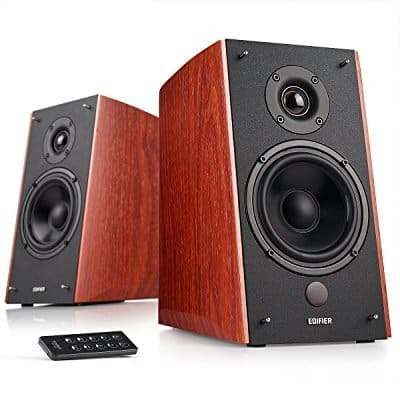 While the majority of bookshelf speakers are two-way, Yamaha’s NS-6490 is a 3-way speaker with three drivers: 8” woofer, 4” midrange, and 7/8” tweeter. The woofer and the midrange are cone drivers, while the tweeter is a metal dome. The recommended nominal input power for these bookshelf boxes is 70W, while the peak power handling is at 140W. They are rated at 90dB sensitivity and 8Ω nominal impedance. 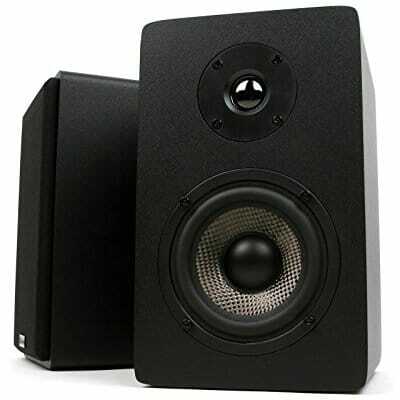 The sensitivity is average for bookshelf speakers but the 8Ω impedance makes them easy to driver. The frequency response range is 45Hz to 23kHz. Sound-wise, these speakers are on the brighter side of the spectrum, so you might need to play around with the EQ. Also, you might want to consider investing in a subwoofer if you want to play materials with super low bass. The cabinets are made of high-quality MDF and come in black finish with silver-colored details to match the metal drivers. These speakers are on the bigger side for bookshelf speakers. Each speaker measures 10.5” (W) x 16.5” (H) x 13.5” (D). The popular SSCS5 is rated at a maximum power handling of 100W and 6Ω impedance. The sensitivity is 87dB (measured with 2.83V at 1m). While having a super-high frequency extension (50,000Hz), these speakers won’t go below 53Hz. This means an additional subwoofer is needed if you want to experience the low frequencies. Sony’s SSCS5 belongs to the economy class. They are 3-way speakers, each featuring a 5.12” cone woofer, 0.98” soft dome tweeter, and a 0.75” soft dome super tweeter. The woofers feature silicon steel plates and MRC cones, while the tweeters are equipped with air-core inductors for a more linear sound. The crossovers are outfitted with high quality components for the price, including thick winding and quality film condensers. The cabinets are made of MDF. They are ported to extend the bass and have a black wooden finish (vinyl veneer, not real wood). They’re on the compact side of the size spectrum at 7.125” width, 13.25” height, and 8.75” depth. Each SSCS5 speaker weighs around 9lbs. The excellent Edifier S1000DB speakers use a classic two-way design with two forward-facing drivers. The drivers are installed at an angle, facing slightly upwards. This is what speaker manufacturers do in an attempt to align the time. Low frequencies travel slower than high frequencies, so if they come at you from the same plane, the high frequencies will actually arrive a little before the lower frequencies. Properly time-aligned speakers will have a more coherent sound overall. The drivers are a 5.5” woofer and a 1” titanium dome tweeter. 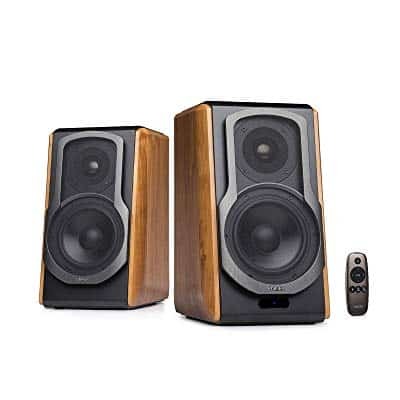 The S1000DB is an active speaker (with built-in amplifier) and has a range of connection options, including the standard 3.5mm AUX and RCA analog inputs and optical/coaxial digital inputs. All the inputs are located on the back panel, along with bass/volume/treble controls and the on/off switch. These speakers are also Bluetooth 4.0 enabled for wireless connection. A remote control is included with the speakers. The frequency response is 48Hz to 20kHz, which is standard fare for a setup without subwoofers or super tweeters. The peak power handling is 120 watts. The stylish MDF cabinets feature combined wooden/black finish. They also sport thin, see-through grills at the front. The overall dimensions are 8” (W) x 13.5” (H) X 10.5” (D). First, let’s make a distinction between active and passive speakers. Active speakers have an amplifier built-in so you don’t need an external amp. However, passive speakers need to be connected to an amp to produce sound. There is an ongoing but inconclusive debate about which ones are better. Overall, active speakers may be regarded as more convenient because they mostly operate on a plug-and-play principle. However, some speculate that their sound quality is impaired because there are too many components crammed into the cabinets. Also, the amps inside some of the active speakers may not have sufficient power. Apart from these reasons, most hi-fi enthusiasts also prefer passive speakers so that they can experiment with different amplifiers. Passive speakers usually have better overall design and integration of the audio components. As I already mentioned, they can be hooked to a variety of amplifiers. Although my personal preference is passive speakers, there are some great active ones you can choose, too. Bookshelf speakers are considerably smaller than their floor standing brethren. That being said, bookshelf speakers are usually two-way or three-way. This refers to how many drivers. 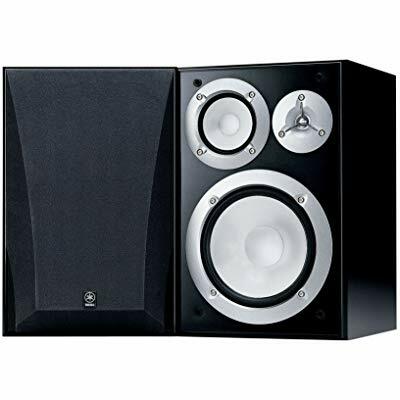 2-way speakers use two drivers and one crossover point, while 3-way speakers use three drivers with two crossover points. A speaker’s power handling is expressed in watts (W), while the impedance is measured in ohms (Ω). These are the most common stats you’ll have to understand when buying bookshelf (or any other type of) speakers. Let’s say your speakers have a power handling range of between 50 and 150 watts. In that case, you will have to match them with an amplifier that’s within range. If the amplifier is rated more than 150 watts, it doesn’t necessarily mean that it will blow your speakers. This will only happen if you play too loud, at which point the amplifier is capable of sending 150W to the speakers and put the speaker drivers in trouble (usually the tweeter will go first). On the other hand, an amp rated under 50W may not be able to supply enough power to your speakers. When it comes to impedance, it is a measure of how much current the speakers need. By the laws of physics, if the impedance or resistance is lower, more current will be able to flow through. Your amplifier must be able to deliver the current to a load/speaker rated at a specific impedance. 8 ohm is the standard so you never have to worry if you have 8 ohm speakers. But if you’re buying 4 ohm speakers, you have to make sure that your amplifier or receiver can handle the 4 ohm load. 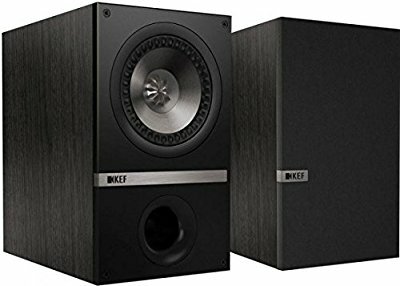 My list of the best bookshelf speakers should give you a better idea on how to upgrade your media system without spending too much money. Remember that the speakers are only one part of the audio system. The sound room and positioning is also a critical part of the system. You can make a pair of speakers sound night and day different by properly setting them up in a room.